Written by Eden Juron Pearlman, Executive Director of the Evanston History Center and admirer of all types of architecture. The experience of working at the Evanston History Center is a mix of many experiences from daily life. It is part work (of course! ), part family, part fun and part school. Actually, it is a lot of school. We work in a very collaborative way and are always learning from each other. Because there is so much school within our work we decided to take a field trip. 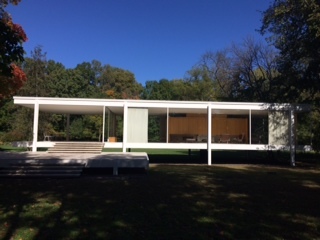 On October 8th Lori Osborne, Janet Messmer, Kris Hartzell, Karen Alvarez and I visited the Farnsworth House in Plano, IL. The drive took about an hour and a half. The house is one of the most important structures in American architecture (No – I’m not exaggerating). None of us were disappointed with the visit or the experience. 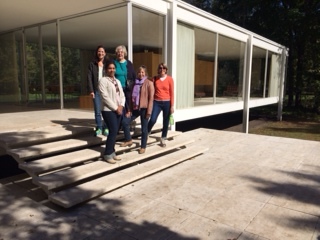 All of us had studied the Farnsworth House, but only Kris had previously visited. For those of you who don’t know, the Farnsworth House, or as we like to call it: the Dr. Edith Farnsworth House, was designed by Mies van der Rohe in 1945 and constructed in 1951. After visiting the house, I can honestly say there is no better example of modern architecture’s juxtaposition of the sleek, streamline design of Modern structure with the natural environment. The house is essentially a glass box sitting in nature with a perfect view of the Fox River. I have wanted to visit the Farnsworth House since first learning about it as an undergraduate student. I’m not sure why it took me so long to visit, but I am so glad that I did. In closing, I have two recommendations for you. 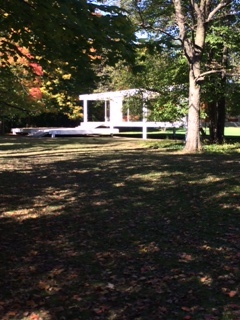 First, visit the Farnsworth House, it is well worth the drive and admission price. Second, if you have always wanted to visit someplace and it is within your reach, don’t wait, just visit.